Winter time and the Quemments are easy? I have a week. Not much happened.....I am a top nerd on the Node. I'm in good company! I'm working on my quemment for the Live Nerdist show in DC. It has the potential to be awesome. If I deliver it right it could be really powerful and awesome. "Time is finite and nonrenewable, do not spend it on things that do not add to your long term happiness!" In this episode I talk about how I humble bragged! Albert Brooks was gracious enough to reply to my tweet and wished Chris Hardwick a happy birthday. This is the LAST time I'm mentioning it. I swear/promise! I talk about the live show. It was awesome! I got home at 1am but it was totally worth it. Gladstone now follows me on twitter. I have a feeling he won't be if he ever listens to this podcast. 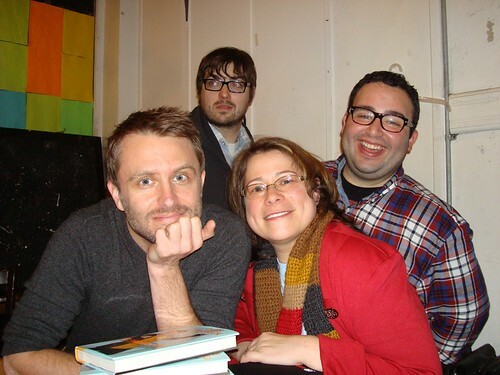 Chris Hardwick had a birthday. I did stuff. Was it epic? Probably not in the big picture of the universe or Mr. Hardwick's life but everyone learned an important lesson and grew as a result. It is currently in beta but shows a great deal of promise as well as the ability to chew up time. I wrote the lyrics and sang the song. I'm not sure it was one of my better ideas. While I love singing I'm not sure others love hearing it. Where did Di Hard goes Nerdist? NOTE: I really need to lay off the Nerdist podcast. I'm picking up too many Hardwick-isms although to be fair they were probably Di-isms first. I suppose I could always use the age card. Yeah! That excatly what I'll do. Oh who am I kidding.